The summer of 2018 is winding to a close, and it sure has been an eventful one here at ScoreVision! From hitting some major company milestones to releasing several new apps and software upgrades, the ScoreVision Team has been busy making the most of these last few months. Check out a recap of what we’ve been working on this summer! This summer, ScoreVision hosted our very first ScoreVision Summer Creative Camp on the beautiful campus of the University of Nebraska at Omaha. You can check out a recap of the 3-day camp here and see work produced during camp by the talented students from across the country in our blog post here. Last month, ScoreVision also hit a big milestone for our company – we completed our first international installation at the International School of Bangkok in Thailand! 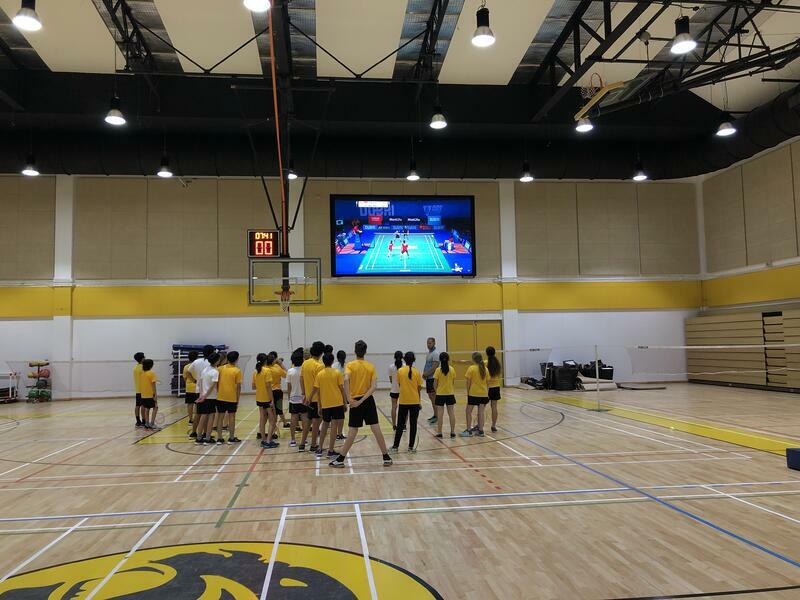 The students and staff at ISB Thailand have wasted no time using their display for alternative uses, including using the LED display to show badminton skills videos to a PE class as pictured below! This summer, the ScoreVision development team worked around the clock to develop and release several new Scorekeeper Apps for various indoor and outdoor sports, as well as increase the functionality and refresh the user interface of some existing Scorekeeper Apps. See screenshots from some of our new apps below! Over the summer, ScoreVision expanded its lineup of traditional and non-traditional sports by releasing a brand-new Badminton Scorekeeper App for iOS. 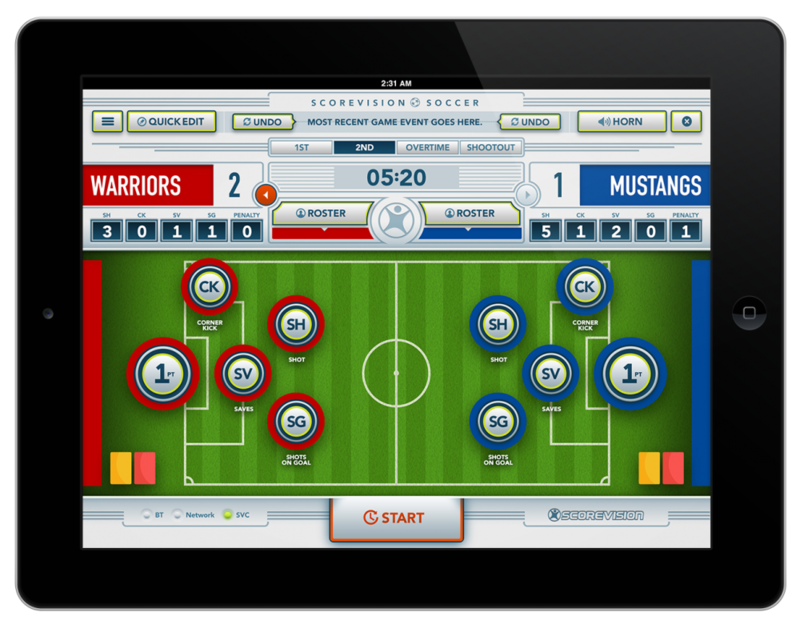 The app allows for intuitive, perspective-based scorekeeping and the multimedia features that a ScoreVision system is known for. See a screenshot of the new app below! We also added baseball to our line of sports scorekeeper apps, featuring intuitive, perspective-based scorekeeping that simplifies the efforts of scorekeepers. The Baseball Scorekeeper App also integrates seamlessly with our Producer App to bring rich multimedia features to baseball games. Other notable features of our new baseball app include the ability to access and adapt the roster throughout the game via an easy-to-use interface, professional-level scoreboard views such as players’ positions on the field and within the lineup, and an automatic pitch counter so pitches no longer need to be logged manually. 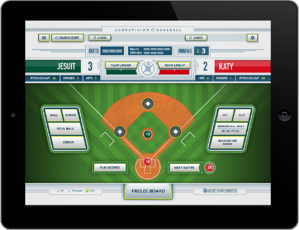 Learn more about how the ScoreVision Scorekeeper App for Baseball enhances baseball games here. Though we have supported the scoring of wrestling matches through our web-based app, we transitioned our web-based Scorekeeper App for Wrestling to an intuitive iOS app that makes it easier than ever to score wrestling matches and keep tournaments flowing effortlessly. This new iOS app has robust features including the ability to automatically track blood time, injury time, and ride times of wrestlers. The app features built-in logic that understands offensive and defensive positions and tailors the options available to scorekeepers throughout the match based on what actions are possible within those positions. Learn more about elevating wrestling matches with our Wrestling Scorekeeper App here. Our web-based Soccer Scorekeeper App was also transitioned to an iOS app with our signature perspective-based design and the ability to incorporate multimedia features through our Producer App. Our new iOS version also boasts unique features such as Shootout Mode for simplifying the scoring of a shootout and displaying it in a custom format on the ScoreVision jumbotron display. Learn more about upgrading the fan experience of your soccer games with our ScoreVision Scorekeeper App for Soccer here. 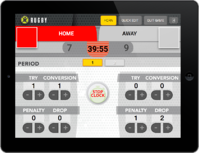 Our Development Team also added new support for intuitively keeping score of rugby and lacrosse games with our web-based Lacrosse and Rugby Scorekeeper Apps. Check out the screenshots below! The ScoreVision Producer App received several major functionality upgrades including features like media playlists, the ability to freeze the displays, and the ability to control multiple displays independently of each other in facilities with more than one jumbotron. Be sure to explore the updated Producer App and utilize its new features to further elevate your facility’s game-time experience! ScoreVision’s Installation Team has had their work cut out for them with what felt like back-to-back system installations at high schools, colleges, and even a middle school this summer! Check out some of our summer installations and the amazing graphics produced by ScoreVision’s Creative Team in the short slideshow video below. As our busy summer comes to close, we’re gearing up for fall and winter sports and continuing to release new software, apps, and features. Stay tuned for more company news by subscribing to our e-newsletter, The Replay, and follow us on Twitter and Facebook to be the first to hear about new releases and company happenings. Ready to learn more about the innovative LED jumbotron display and software system that’s taking the scoreboard industry by storm? Request more information today!